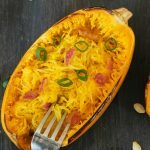 Creamy, rich stuffed spaghetti squash. Place cut side down on a baking sheet and bake at 400 for 40 minutes or until a fork can poke it easily. While your squash is baking, make the filling. Place oil and onion in skillet and cook on low until translucent. Add garlic, red pepper, salt, and spinach. Add cream and stir in parmesan cheese. Scrape the strings of squash out of the shell with a fork and place in skillet. Mix all ingredients together and place them back in the squash shell. Bake in a 350 oven until cheese is melted, bubbly and slightly browned.